No dues. No meetings. No minutes. "It's certainly not a club," says Three Hills' Glenn Loewen, "it's not a gang, and we have no leader." It's just a group of area motorcycle enthusiasts who look forward to Wednesday evenings because they meet at the Catholic Church parking lot at 6 pm and hit the open road together. 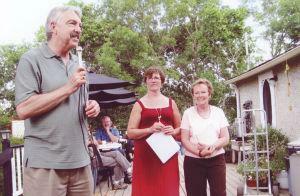 Staff at the Trochu Arboretum anxiously kept scanning the skies on July 22, trying to make a decision as to where their annual Friendraising Supper should be held. Clouds were rolling around, but didn't appear too threatening, so set-up began at the grounds with option of racing to the Community Centre if necessary. The crowd of 185 arrived and soon the tables were full. Approximately 60 young people and adult sponsors from four local churches participated in a Community Action Project recently. Brandi Hoszouski is the program director for the Three Hills Child Care Center and School Age Program. The program runs year round, with a summer program, and another that runs after school and weekends. One center is designed for children 12 months to six years, and can accommodate 34 children. The older, school age children (kindergarten to grade six), are in a separate center that allows for 20 children.